We have to be perfectly honest here: when we first heard about the DotStone Music LED Strip Lights, we thought the concept was a little silly. Once we installed a pair of the company’s light strips and tried the music sync feature though, we were instantly singing a different tune. These awesome LED strips come in three different lengths — 2 meters, 5 meters, and 10 meters — and they start at just over $13. 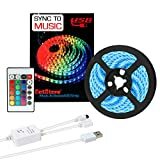 Plug them in, put them in music activated mode, and then crank up your sound system to make the slick multi-color LED lights flash along with the beat of your music.